Be the first to share your favorite memory, photo or story of Frederic. This memorial page is dedicated for family, friends and future generations to celebrate the life of their loved one. Frederic Dale Hamilton, of Edgar Springs, MO, passed away Friday, January 25, 2019 at the age of 85. He was born on February 9, 1933 to the late James Hamilton and Eunice (Mitchell) Hamilton. On November 5, 1955 he married Janet (York) Hamilton in Licking, MO. “Blessed are those who mourn, for they will be comforted” Matthew 5:4. Last week our family lost the cornerstone of our family. Although our hearts are broken, we are also filled with such peace. Dad ran a long, hard and difficult race.. but the finish line has been crossed and he has seen Jesus face to face! The words “well done my good and faithful servant have surely been said”! He loved God and tried to live his life as Christ like as he could. We will miss his laugh, his stories, his teasing, and his wisdom. As will so many others. He loved people and invested in so many lives. If you were lucky enough to know dad, you probably loved him. 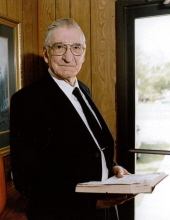 He loved his beloved Edgar Springs Mo, and his precious Full Gospel church. He has left his footprint upon the fabric of Edgar, the community and his family, Heavens gain is our loss. But we have the blessed assurance that we will see him again! Fred will be sadly missed by his surviving family which includes: his wife, Janet Hamilton of Edgar Springs, MO; three daughters, Lisa Nash and husband, Gary of Salem, MO, Karen Newkirk and husband, Mike of Rolla, MO and Angie Freeman and husband, Chris of McKinney, TX; nine grandchildren, Elizabeth Zander and husband David, Joshua Nash and wife Jaimi, Caleb Copeland, Cameron Copeland, Megan Zika and husband Chris, Brandon Newkirk, Emily Freeman, Andrew Freeman and Hannah Freeman; four great grandchildren, Atticus Zander, Maizi Nash, Adelyn Zika and Ross Zika; a niece, Christa Barnes; three sisters-in-law, Jean McCluskey and husband Walt of Edgar Springs, Lynne Montrey and husband Hank of Edgar Springs and Ms. Kay (Harris) Stevenson of Ohio; extended family and a host of many relatives and friends. To send flowers or a remembrance gift to the family of Frederic Dale Hamilton, please visit our Tribute Store. "Email Address" would like to share the life celebration of Frederic Dale Hamilton. Click on the "link" to go to share a favorite memory or leave a condolence message for the family.